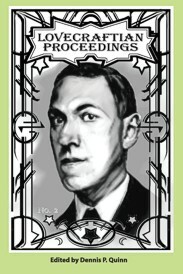 Lovecraftian Proceedings is the Official Organ of the Dr. Henry Armitage Memorial Symposium. Established in 2013 as a key part of NecronomiCon Providence, the Armitage Symposium fosters exploration of Lovecraft as a rationalist who created an elaborate cosmic mythology, and how this mythology was influenced by, and has come to influence, numerous other authors and artists. Lovecraftian Proceedings Number 2. Edited by Dennis P. Quinn. New York, NY: Hippocampus Press; 2017; ISBN 978-1-61498-190-9; paperback; 276 pages.